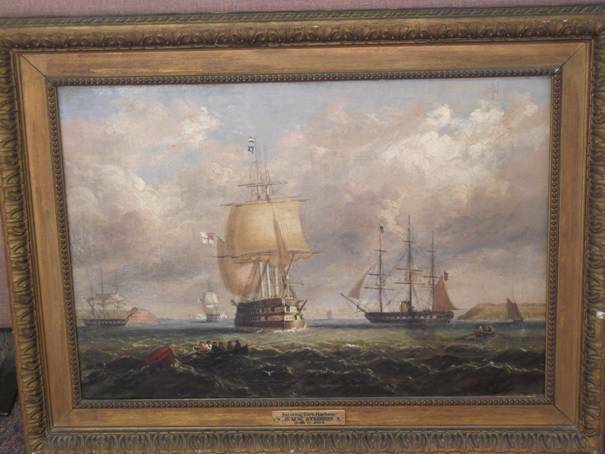 Subtitled ‘An event in the history of Ireland — ‘Two Admirals in command and three first rate ships in the Cove of Cork’, this painting depicts the visit of the White Squadron to Cork from August to September 1843. This visit coincided with the 13th annual meeting of the British Association in Cork, which began on 13th August 1843. ‘The Cove presented a very animated appearance and just previously a series of grand fetes were given on board several of the ships of war lying here. That on board the Tyne (the admiral’s ship) was on a very grand scale, nearly 300 of the elite of the town and neighbourhood of the Cove assembled and continued the merry dance until morning. The vessel was very tastefully fitted up, having a spacious saloon on the deck and on the gun deck a splendid supper was laid out. However, by September, when Atkinson painted this work, Tyne was no longer in Cork. The ships depicted in Atkinson’s painting are Caledonian (I20 guns), Camperdoiun (I04 guns) and St Vincent (120 guns). The admiral of the White Squadron was Sir Charles Rowley, and the white flag on St Vincent, shown stern view, indicates this was his Flagship (the use of squadron colours continued until 1864). The St Vincent was a three-deck battleship, with a high, ornate stern. It is shown here surrounded by pinnaces, a paddle steamer and a cutter. seen as his ship was part of Rowley’s squadron. guns commanded by Captain F. Brace dropped anchor inside her; and the Caledonia, 120 guns, Captain Alex Milne, and the Euridice, Z5 guns lay outside her. The vessel having the flag of Admiral Bowles, saluted the ﬂag of the admiral of the squadron, by firing 17 guns, which were answered by a similar discharge from the St. Vincent. Cove is now honoured with the presence of two admirals in commission. It is expected that the ships will remain at Cove until the 10th October. Atkinson, a one-time ship’s carpenter, inspector of shipping and self-taught marine painter, earned a living depicting Cork’s maritime environs. He specialised in notable events in Cork Harbour; in particular the visit of Queen Victoria, which took place in 1849. Queen Victoria visited Cork briefly in August 1849. In honour of the event, George Mounsey Wheatley Atkinson mounted an exhibition of his maritime paintings in a pavilion in Cove (Cobh), constructed specially for the Royal visit. The artist responded with enthusiasm to the visit, producing several different paintings of the Royal Squadron in the harbour and the landing of Queen Victoria and Prince Albert at the town of Cove itself, which was renamed Queenstown in honour of the event. Apart from a lithograph based on a drawing by one of the ship’s officers (published in aid of the Female Orphan Asylum in Cork), and some wood engravings in the Illustrated London News, Atkinson’s paintings appear to be the only visual record of this visit to have survived.